For the bread: Preheat the oven to 350 degrees F. Spray a 9- by 5-inch loaf pan with cooking spray. Whisk together the flour, baking soda, cinnamon and salt in a medium bowl. Beat together the peanut butter, brown sugar and granulated sugar with an electric mixer on medium-high speed in a large bowl until smooth. Beat in the egg and vanilla, then fold in the mashed banana. Add the flour mixture, and beat on medium-low until just combined (it's OK if there are some lumps). For the glaze: When the bread has cooled, combine the peanut butter, butter and confectioners' sugar in a medium microwave-safe bowl, and microwave in 30-second increments, stirring after each, until smooth. Let the glaze sit until it has stiffened up a bit but is still spreadable. Spread over the top of the bread, and sprinkle the peanuts on top. Let sit for 10 minutes to set up before slicing. The bread can be stored at room temperature in an airtight container for up to 3 days. What's better than a snickerdoodle cookie? A snickerdoodle cake. That's right. The Food Network Kitchen created a cake that tastes just like the cookie, but it's cake, so it's even better! Whisk together the flour, baking powder, cinnamon and salt in a medium bowl. Whisk the egg white, milk and vanilla together in another medium bowl. Beat the butter and sugar in a large bowl with an electric mixer on medium-high until light and fluffy. Add about a third of the flour mixture and beat on medium-low until incorporated. Now add a third of the egg-milk mixture and continue to beat on medium-low until incorporated, scraping down the side of the bowl as needed. Repeat with the remaining flour and egg-milk mixtures, finishing with the flour. Divide the cake batter evenly between the prepared cake pans and bake until the cake bounces back when pressed and a toothpick inserted in the center comes out clean, 25 to 30 minutes. Let cool completely in the cake pans on a rack. Need to feed a crowd over the holidays? 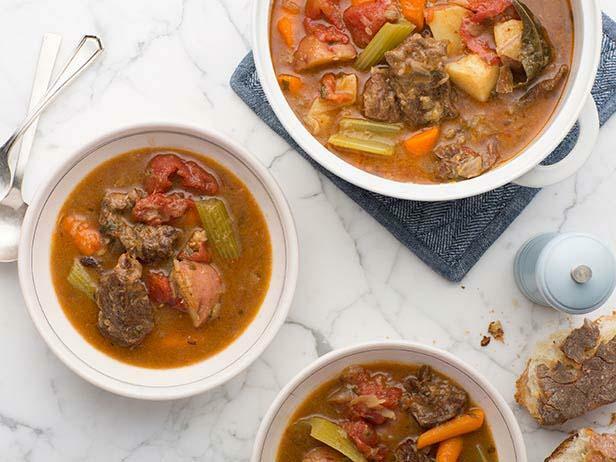 This stew from Food Network is the answer during the cold winter days to come! A "How-To" video is available by clicking the picture below. Heat a large Dutch oven with a tight-fitting lid over medium-high heat. Pour in enough oil to fill the pan about 1/4-inch deep. Season the beef generously with salt and pepper, and add to the pan. Saute half the meat, uncovered, stirring only occasionally, until well-browned, about 8 minutes. Using a slotted spoon, transfer the beef to a plate. Repeat with the remaining beef. Discard the oil and wipe out the pan. From breakfast treats to desserts, our holidays are much "sweeter" when you have a little chocolate something to go with that cup of coffee or tea. Click on the picture for Ina Garten's recipe for "Fleur de Sel Caramels". Here is a simple "but looks like you spent hours in the kitchen" apple dumpling recipe shared by Trisha Yearwood, who in addition to being a fabulous country singer, she's got a cooking show and is married to Garth Brooks! Click on the picture to get the recipe. 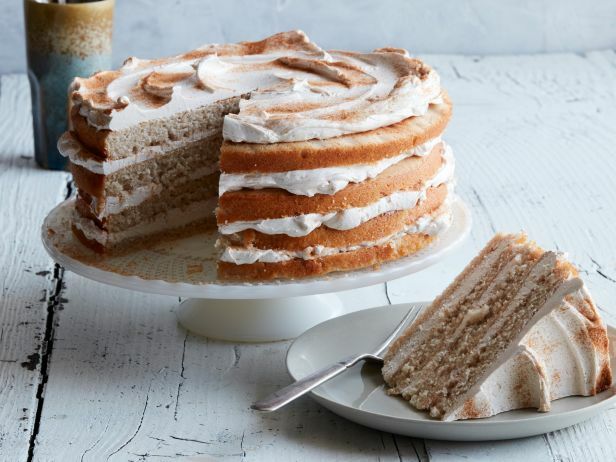 Anne Burrell is seen on many Food Network cooking shows, and this Apple Spice Cake with Cream Cheese Frosting stands out as a great cake to serve during the holidays, great as a breakfast or dessert, or to give as a gift! For a sweet treat that is definitely dessert, try this White Chocolate Peppermint Bark! We found this recipe on the Sweet Dreams cooking show hosted by Gail Gand. It's super easy to make, you only need three ingredients - Really! Here are some easy brunch dishes for entertaining or feeding hungry house guests! This Mushroom-Spinach Baked Eggs Casserole from the Food Network Kitchen will make you feel like you are eating breakfast in Europe! The gruyere cheese makes this dish seem really gourmet and one that you will be proud to serve to your guests! The Food Network Kitchen has come up with another winner in it's Pancake Breakfast Casserole. You can save time by making this dish ahead of time and freezing it, or by using ready-made frozen pancakes. The creamy custard baked in with the pancakes combined with blueberries (or mixed berries of your choice) makes this a perfect holiday breakfast. Here is a different take on the old "ham and cheese casserole" try this Breakfast Cornbread Casserole, another great one from the Food Network Kitchen. Here is another great brunch casserole by Food Network Kitchen, Corned Beef Hash Brown Casserole - it's gluten free and a hearty breakfast meal! Our final brunch recipe is a Spinach, Mushroom & Cheese Breakfast Casserole from Food Network Kitchen. We hope you enjoy this meatless brunch entree - it's one of our favorites. This dish is especially great as you can use up your leftover bread as the top crust and it becomes the star attraction. We hope you find one or more of these recipes perfect to make over the holidays! They all sound great, cannot wait to try them.. HAPPY HOLIDAYS TO EVERYONE AT THE OFFICE!! Posted on 04/08/2016April 12 is Grilled Cheese Day - Some Recipes Below That You Will Want to Make! Posted on 02/04/2016February 4th is Homemade Soup Day!